Dara: I liked the style, I liked that each chapter in the present was broken up by a letter of Ingrid's. But I didn't think they were juicy, or tell us anything that we couldn't have guessed. And I hated Flora. And Gil. Overall, I'd have to give it 3 stars. Kayla: I agree. Gil was basically a creep who took advantage of his vulnerable student and never really seemed to love Ingrid. He was a liar from the get-go, lying about where he got the flower and I wasn't a fan of him. The entire book, I thought that Flora was schizophrenic or had amnesia or something. I really thought she had something mental going on. I also enjoyed the letters, but I wish I would have gotten more from them. I think it would have worked better if they were just chapters from her view points, and some letters inside. I understand the purpose of the letters, since she was hiding them in the books, but I don't understand why should would have been writing her life story to someone who already knew most of what was in the letters. I think I liked Jonathan the best, honestly. D: I liked Jonathan too. And I would have liked Richard, but he seemed to be blind to Flora's ridiculousness, which killed it for me. I didn't understand why or how Louise still could have been that well connected to the family, especially years and years after her 'friend' disappeared. In Ingrid’s defense, I kind of understand why she stayed. In some of her letters I think she did a good job of explaining her point of view, or at least made you empathetic to her situation. I liked that Gil had found her letters, and began this manic book search to potentially find more, that was actually one aspect of the book that I liked -- I thought it was really interesting that their house was crammed with books. But it got a bit weird. K: It did get weird. I was very hopeful that Ingrid was still alive and that she perhaps took Jonathan up on his offer to stay at his home, where was it? In France? I can't remember. D: I think it was Ireland? Yeah, I was really hoping for that too. K: I felt like Nan and Richard had this weird connection and I felt like he was oddly linked to the family, even though Flora said they were just sleeping together, which is why I thought maybe she had amnesia and Richard was her husband or fiancé, or something. D: That would have been an interesting twist for sure. Can we talk about the whole Gil in a pink dress on his deathbed situation? What was that? K: I almost wish it would have been. I think I would have liked the book more, because Flora was terrible. And yes. I had to read that over and over, because I was like "WHAT?" and everyone was just so calm with it like it wasn't at all weird. I really felt like that was unnecessary and odd. D: And how could the author not have gone any deeper with Gil's first born child? It's like she brought in this earth shattering situation, decided to put it away for a bit, and then bring it back when Gil was dying. It was just... meh. The description of Swimming Lessons really sold me. And it wasn't what I expected. K: I agree. It was not at all what I expected either, and really, I thought there'd be a little more suspense to it. I was expecting more of a thriller-type novel, and that isn't what I got at all. I definitely felt like the author could have done more with Gil's illegitimate child. It was just like an "Oh. He found out right before you all got together." and then nothing else. K: I probably wouldn't read another by her either. I got through it in a day, because of how the book was set up and I kept thinking I would get more, but was dissatisfied in the end. 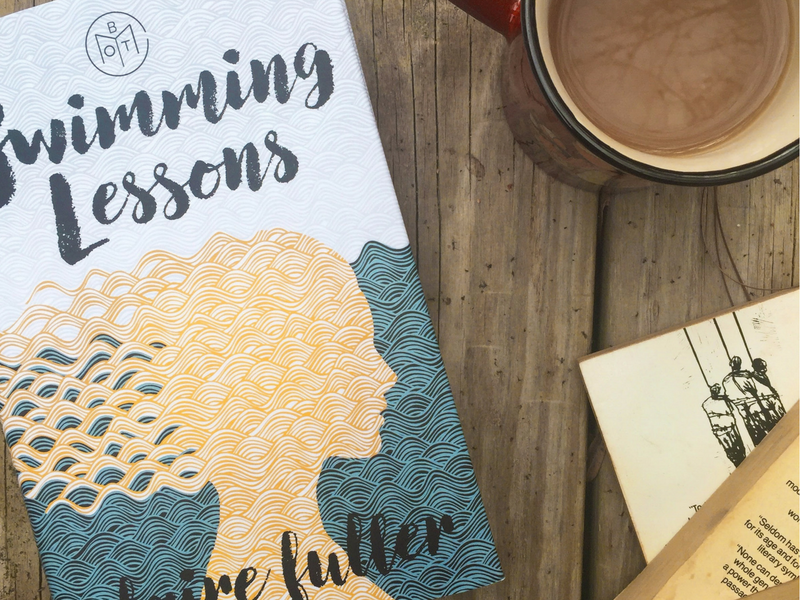 Neither Dara or I seemed to enjoy Claire Fuller's debut novel, Swimming Lessons. Join us on February 28th, where will be discussing Missing, Presumed by Susie Steiner. 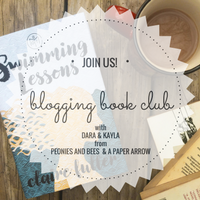 The Blogging Book Club will take place the very last Tuesday of each month. If you have any suggestions for an upcoming month, please let us know! If you're interested in joining us this month, feel free to grab our button and link-up below. 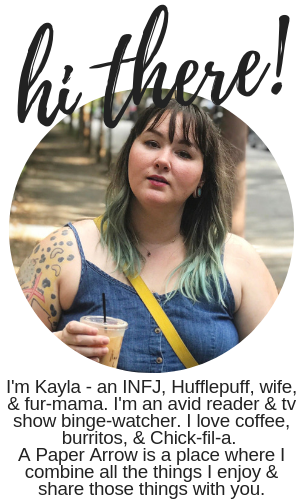 Any book-related posts are welcome! Awe I'm sad to hear that you guys didn't love this book! I haven't read it yet so I tried to avoid spoilers lol. Lol. Go you for reading the post but bypassing spoilers! I hope you still read the book, and I can't wait to hear your thoughts on it. Sure thing. Feel free to link back to us, too!